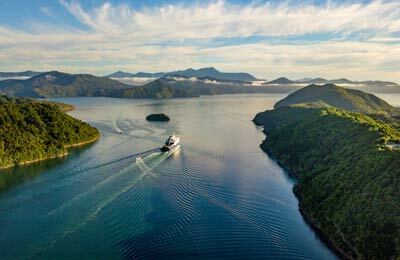 Picton is a gateway to the Marlborough Sounds, its wine growing areas and, further south, to Christchurch and beyond. You can compare and find the cheapest ferry crossings available from Picton with our easy to use booking form. Interislander is the ferry company that operates out of Picton. Interislander is one of New Zealand's best known ferry services and provides a service with three ultra-modern luxurious ferries. All their ferries feature the latest facilities to make your journey enjoyable. On board, you will find many observation decks, relaxing chairs and sofas, bars, and restaurants serving freshly prepared local cuisine. Some ferries also feature cinemas and children's play areas. Travelling on an Inteislander ferry truly is a magnificent experience and the views you will enjoy en-route are worth the ferry fare alone! The Picton terminal currently operates between 8.00am and 8.00pm Monday to Saturday, and between 8am and 11.00pm Sunday. Operating hours may vary to accommodate timetable changes. If needed boarding assitance can be given. You will find Internet access is provided at the port for a nominal fee. You can either use WiFi or dedicated internet kiosks. Picton port is well sign posted and easy to reach by car. Port Marlborough provides 60 minute car parking near the Picton terminal entrance, free of charge. Long-term parking is available approximately 200 metres from the terminal (near the Old Railway Station). This is Pay and Display and currently costs $1 per hour, or $6 per day. The pay and display machine is located in the main long-term car park. Coins for the pay and display machine can be obtained from the Interislander Ticket Counter. If you use GPS in your car, Interislander terminals can be found in the Points of Interest menu, usually in the Transit or Ferries categories. Picton terminal Latitude - 41. 17.136599999999902 and Longitude 174.0 0.3084000000006881. If you are arriving by Coastal Pacific train, you should make your way from the train station to the Interislander Check-in terminal by foot (approximately a 4 minute walk). Cross the road from the train station to the i-site, turn left and follow the blue line to the Interislander main doors. Many of the water taxi operators will drop you off at the commercial jetty adjacent to the Interislander terminal upon request. In addition, many of the local accommodation providers operate their own courtesy vehicles. Several water taxi companies operate from the Picton foreshore including Cougar line and Beachcomber cruises. You can find them 10 - 15 minute walk from the front of the Interislander Terminal. Many of these companies offer a pick up from the commercial jetty next to the Interislander terminal upon request. A bus and shuttle stop for services coming from out of town is conveniently located at the Interislander terminal. On foot For those on foot, the terminal is just a few minute's walk from the Picton town centre. Follow the blue line from the bottom of the main street past the i-site to the terminal front doors. Book your ferry to maginficent Picton with AFerry. 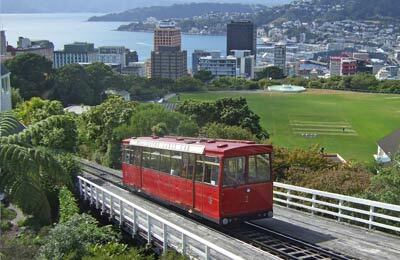 Picton is picturesque seaside town in New Zealand, often referred to as the Gateway to the South Island. Ferries run all year round across the Cook Strait to Picton from Wellington on the North Island. Picton is nestled at the head of Queen Charlotte Sound, in the stunning Marlborough Sounds and is one of New Zealand's prettiest seaside towns, with an attractive seafront dotted with cafés, restaurants and galleries. From Picton you can hike or moutain-bike across the Queen Charlotte Track, one of the finest and most diverse coastal tracks in New Zealand, or take a half-day guided sea kayaking tour along the western end of Queen Charlotte Sound to see eagles rays, cormorants, little blue penguins, seals and dolphins.